This means as a student, you can rest assured that your program provides up-to-date quality education that received a stamp of approval from a respected accrediting body. Unitek College’s campuses are accredited by the Accrediting Commission of Career Schools and Colleges (ACCSC), an accrediting agency recognized by the United States Department of Education. Unitek College is proud to announce that the baccalaureate degree in nursing program at Unitek College is accredited by the Commission on Collegiate Nursing Education (http://www.aacn.nche.edu/ccne-accreditation). Unitek College is honored that the Commission on Collegiate Nursing Education (CCNE) has recognized and accredited our RN to BSN program. The Commission on Collegiate Nursing Education (CCNE) is an autonomous accrediting agency that is officially recognized by the U.S. Secretary of Education that contributes to the improvement of the public’s health. The CCNE accreditation is an important evaluation which validates Unitek College’s quality of education to the alumni adding credibility and respect. Unitek College™ is a privately held vocational school dedicated to helping you gain the skills needed to advance your career or begin a brand new career. Your training at Unitek College will position you to take advantage of the rising demand for experts in allied health, nursing, and technology professions. 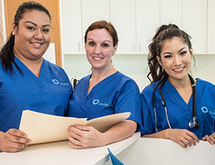 Our programs include Medical Assisting, Pharmacy Technician, Dental Assisting, Vocational Nursing, and Bachelor of Science in Nursing: RN-to-BSN Degree Completion.Unitek College features modern laboratories that simulate a real work setting, qualified teachers willing to give you the attention you deserve, and employment assistance after you graduate. Unitek College offers six convenient facilities in Northern California with campuses in Fremont, San Jose, Hayward, Concord, South San Francisco, and Sacramento. Unitek College provides professional development, externship and clinical placement, and employment assistance to its students. We strive to make sure all of our students receive guidance and mentorship from Career Services specialists. Through this partnership, students acquire skills that help them find and maintain employment. The department is staffed with full-time professionals who lead the student community to build a foundation for a strong career. This team of Career Services Coordinators and Managers are proud of the commitment and dedication our students bring to their training, and it is their single-minded mission to assist graduates with employment in their new career field.